The Obverse & Reverse Die Gallery presents a complete Liberty Seated Dime Varieties reference set. Since 1987, this varieties reference set has been continually upgradied to capture new date obverse and reverse dies, die marriages and die states. The set is illustrated by individual dates and mintmarks. As of August 2013, the Gallery is being re-formatted and includes the individual rarity ratings for each variety. Simply scoll down and click on the desired date or mintmark to view its Gallery. Once in a date's Gallery, click on any of the obverse or reverse images to access that varieties' description contained with the web-book database. Users may find the Gallery to be the fastest way to attribute Seated dime varieties and determine a rarity rating. First identify the Denticle Ruler measurement for the obverse, then scroll down to view the potential matching varieties. If there may be a potential match with a set obverse/reverse images, then click on those images to view the detailed variety page with its macro images and key diagnostics points. Denticle Ruler attribution tables are available as part of the gallery guide. 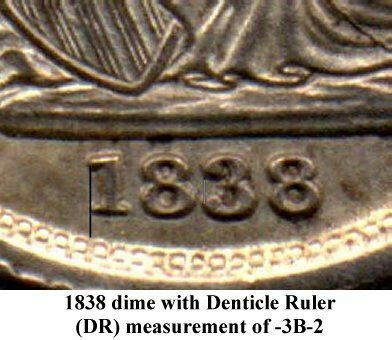 For each date and mintmark in the Gallery, the Denticle Ruler (DR) table is a header for the file. 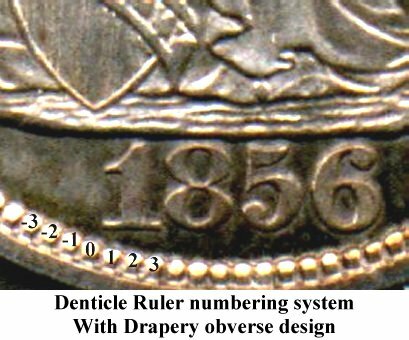 The DR table is an easy to use sighting method for determining the difference between obverse dies and facilitates within date obverse die variety attribution. 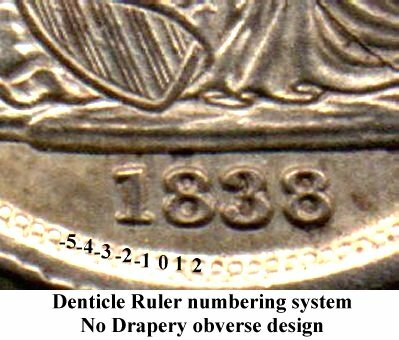 The following images present visual examples of the denticle ruler measurement system for No Drapery and Drapery obverse hub designs. To determine the denticle ruler position of a date, the placement of the outer end of the left foot of the 1 in the date is compared to the denticle directly below it. 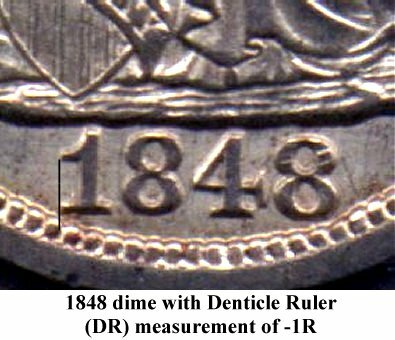 A measurement of the date position is then taken from the denticle ruler numbering system illustrated above. Examples of denticle ruler measurements are presented for No Drapery and Drapery obverses in the following images.